Longworth Style Lathe Chucks are the perfect solution for finishing plates, platters, bowl bottoms and more. The chuck has a unique self centering mechanism that automatically adjust to the size of your project and is easy to secure. A 2-1/4" chuck adaptor is mounted to the back of the Longworth Style Chuck which mounts to a lathe using a 4 jaw standard chuck (#2 or 50mm). This allows you to mount and remove the Longworth Style Chuck quickly and easily. Your project is secured by rubber gripping buttons that provide pliable firm gripping power when tightened. The chuck is made from 1/4" phenol ic plates that give you years of service and performance. 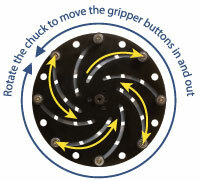 The Longworth Style Chuck grips your project by simply rotating the phenol ic plates. This moves the gripper buttons in or out to the exact position you need. The chuck can grip your project from the outside (outside compression mode) or the inside (inside expansion mode). Once the gripper buttons are firmly up against your project, secure them by tightening the wing nuts.